Meghan is 16 when it happens to her. It is a school everybody has to go to before they are let into Heaven. On the boat she meets Mick who has been dead for more than a hundred years but still looks like a teenager. He helps her past the difficult beginning at the new school in a new world. One day some of Meghan's roommates find a mirror in the cellar of the school and they persuade her to go through it with them - well knowing it is strictly against the rules of the school. Meghan ends up back on earth where she meets Jason. But Jason is in danger and Meghan know something important. Something that is a matter of life and death. Soon she is forced to choose between the two worlds. The one she belongs to now and the one she left. 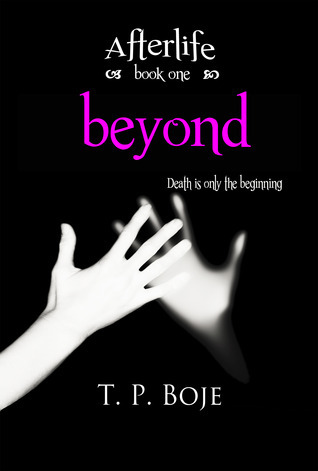 Beyond seemed like a book that would be a cute and quick read. It was a quick read. It was cute. But it wasn't my taste. I did enjoy the lead, Meghan and her determination to figure out how she died. But mostly, I liked Mick. But, because it was such a quick read, I didn't get to know him or any of the characters. I felt like things happened and then they were over. I would've liked to know why she liked spending so much time in the human world with Jason by actually reading about it as it happened. I liked the way the ghost academy was created. To me, the way the school is described reminded me a little of Harry Potter & Hogwarts. Obviously I would never compare another book to that genius series, but it was the first thing I thought of. If you like a quick read, in my opinion, directed to the middle grade side, then you'll like this. Aw I'm sorry you didn't enjoy this one as much as you had hoped. I have this one in my review pile so I'm still going to be giving it a chance. I pretty much feel the same way...but different. I for one could not stand the fact that they could breathe, their heart stopped and things of that nature. If that didn't have it in it and really made me feel they were spirits and not just people claiming to be them, I would have liked it much better. I give it about the same as a rating. I agree about the breathing, now that I think about it. It bothered me too.